My project below features today's Marvelous Monday digi - 'Peter'. 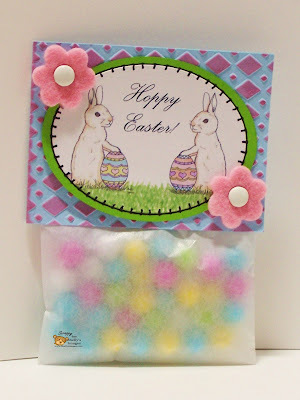 I used the image to make a topper for a pouch of peanut-free candy for my daughter's Easter basket! I am also making several more to give out to some of our neighborhood friends. I'm sure they'll LOVE them! Head over to the SI SHOP to nab this image yourself! I love this little topper for a candy bag Scrappy! And I love how you mirrored the images. That turned out so great! This is so cute! I haven't made the bag toppers yet but I am going to give them a try. Wondeful job on the coloring! Thank you for joining us at the Digi's With Attitude! Anything Goes Challenge. We hope to see you at the next challenge and good luck! Hi Scrappy! Girl, you already know how much I love this! So yummy! You have me wanting candy now! Thank you so much for playing along with us at Digi's With Attitude! So very sweet! Thanks again for playing along with us at PPA this week! What a cute Easter topper! So glad you linked it at Craft Us Crazy! This is yummy, Ms Scrappy! such a pretty bag! thank you again for playing along with us at the Shoe! This is so cute!! Thank you for joining us a Simply Create for our DIY challenge and hope to see you for the next fun challenge that we will have starting today. 4/29 Freebie Friday at Bugaboo Stamps! Christmas in April with OSAAT! Freebie Tuesdays in April at Bugaboo Stamps! Freebie Tuesday at Bugaboo Stamps! 4/4 New Challenge at OLLCB! 4/3 New Challenge at Pile it On!